Oil sands are one of the world’s most significant energy resources and provide an important source of energy for North America. They are energy- and water-intensive and must be developed responsibly. Oil sands are found in three deposits in Alberta and parts of Saskatchewan in Canada. Muskeg River Mine in Alberta, Canada. Oil sands are a mixture of bitumen – a heavy oil – sand, water and clay. Some of the oil sands are found within 70 metres of the surface, where they can be mined, but most are deeper underground. Conventional wells are used to produce deeper-lying resources, often with steam injected into the reservoir to heat and thin the bitumen to ease its flow. 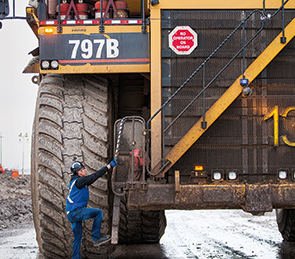 The Athabasca Oil Sands Project (AOSP, Shell interest 60%) uses giant trucks and mechanical shovels to extract the oil sands mixture at its Muskeg River and Jackpine mines. Once separated, the bitumen is diluted with solvent for piping to the Scotford Upgrader, and converted into synthetic crude oil for refining into products. In 2013, Shell’s share of AOSP production was around 126,000 barrels of oil equivalent (boe) a day and production from deeper-lying, or in situ, oil sands operations was around 19,000 boe a day. This makes up around 4.5% of Shell’s global oil and gas production for the year. In 2013, we announced our decision to go ahead with the Carmon Creek project in Alberta. This is an in situ oil project that is expected to produce up to 80,000 barrels of oil a day. The project has been designed to make efficient use of the gas and water that is produced with the bitumen. We also received regulatory approval, with environmental and community conditions attached, for the Jackpine Mine Expansion, and began a review of its operations with our partners. The potential expansion could add 100,000 boe a day of production. Some opposition exists to the development of oil sands. We work with aboriginal peoples in local communities so that any development has limited impact on traditional land use and culture. We are helping to develop local skills and businesses among the aboriginal communities: AOSP has invested over C$1.5 billion since 2005 in contracts with around 70 aboriginal businesses and contractors that provide a broad range of products and services to our operations.